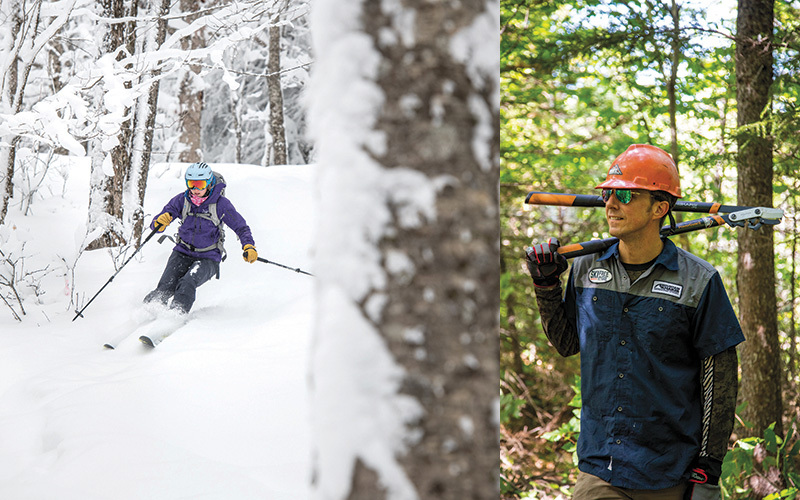 Left: Ryan Bent; Right: Granite Backcountry AllianceA GBA volunteer (left) scores a righteous glade ski in New Hampshire, thanks to off-season trail work (right). A frigid northwest wind greets me as I near the summit of North Doublehead Mountain in Jackson, N.H. The temperature is hovering in the mid-20s, but the fierce gusts make it feel much colder and will keep me from lingering too long at the top. No sweat, I think. I’m not here for a picnic. I’m here to ski. Unlike ski resorts, with their abundance of trails and lifts, Doublehead offers one ski trail and no lift service. The only way to ski this 3,000-foot mountain is by hoofing it 2 miles from the parking lot to the summit, lugging your skis on your back or attaching climbing skins to your skis, as I’ve done. It’s a workout but well worth every step. Once I reach the summit, I peel off the skins and stash them in my backpack. I adjust my bindings, lock my boots, take a deep breath, and use my poles to push off into the brisk mountain air. As I lean into my first turn, my legs are still burning from the steep uphill climb, but they settle in quickly as I accelerate downhill over the soft, untouched snow, into the peaceful boreal forest. This beautifully designed, zigzagging trail originally was cut in 1934 by the Civilian Conservation Corps (CCC), an initiative of President Franklin D. Roosevelt’s New Deal that employed men ages 17 to 28 for conservation projects on public land across the country. By the early 1940s, the CCC had cut more than 60 ski trails in the White Mountain National Forest. Some of these were later incorporated into New Hampshire’s burgeoning ski resort industry, including Wildcat and Cannon mountains, while other trails eventually fell into disuse and were abandoned as the popularity of lift-serviced ski mountains grew. But with the resurgence of uphill and backcountry skiing in the Northeast, due in part to advancements in alpine skiing gear and in part to greater access to public lands, a new wave of off-piste skiers and snowboarders are seeking out these remote trails of yesteryear—me included. As the wave swells, the demand for more skiable terrain has increased dramatically, putting pressure on public land managers to respond. Enter Granite Backcountry Alliance. Tyler Ray, the chief of GBA’s board, as well as a business and real estate attorney in New Hampshire’s Mount Washington valley, founded the North Conway-based 501(c)(3) in 2016 with the mission of advocating for the expansion, development, and maintenance of backcountry terrain in New Hampshire and western Maine. Practically speaking, “We want to work together with land trusts and communities to help diffuse the heavily used [ski] areas and bring attention to trails that normally wouldn’t see a lot of visitation,” Ray says. In New England, where the once-logged forests of the early 19th century are now densely vegetated, backcountry skiing trails are few and far between, and several of those that do exist were illegally cut, enraging landowners and potentially harming fragile habitats. GBA’s goal is to replace guerrilla clearing with community-sanctioned skiing—both by reviving old CCC trails and by developing new wooded ski zones, known as glades. “Due to the very limited supply of terrain, our aim is to create a unified culture of skiers—one that respects the land and its owners and does not permit unauthorized cutting,” says Ray, who first learned to ski at age 2 on Maine’s Pleasant Mountain. “Expanding the playground” of skiable terrain, as Ray calls it, isn’t a single-handed affair. Before an ax is swung or a limb is cut on any of GBA’s proposed runs, professional designers analyze the terrain, and the U.S. Forest Service conducts an environmental review—not unlike AMC’s process for hiking trails. The glades, skiable sylvan corridors roughly 50 feet wide, are created by thinning the forest’s underbrush, composed of saplings and the like 4 inches or less in diameter. Leaving the larger trees provides protection from the wind and sun, preserving the snow throughout the season and yielding challenging obstacles to ski around. Once a project is approved by the Forest Service and GBA project leaders have flagged the work area, volunteers come out en masse for trail work days: limbing trees, cutting stumps flush to the ground, and leaving the brush onsite to decompose. Past volunteer projects have included rerouting a half-mile section of Doublehead Ski Trail in summer 2017. For that work weekend, Osetek, Kent, and nearly 30 other GBA volunteers joined the Forest Service in an effort that laid the groundwork for a subsequent new parking lot, built this past fall, designed to improve access to the ski trail and alleviate parking congestion. The effort hit a sweet spot for an organization that aims to expand skiable terrain while spreading out ski traffic. One area of the White Mountains that traditionally sees more snow than people is the small village of Randolph, N.H., population 290. Nestled between the lofty northern Presidential Range and the Crescent Range, Randolph is a quaint mountain hamlet that many tourists tend to cruise past on their way to other North Country ski resorts. What motorists fail to see from their cars are the miles of hiking, snowmobiling, and ski trails tucked away in the town’s 10,000-acre forest, just waiting to be discovered. In recent years, the commission had been looking to attract more winter visitors to the forest. It found its answer in February 2017, when GBA proposed developing five ski glades, appealing to all ability levels, off the summit of Mount Crescent. The commission approved the project, and in August 2017, Ray and some 65 GBA volunteers took to cutting and thinning 75 acres of ski terrain. As the GBA family grows, so do the number and scope of the group’s projects. This past fall, the group worked with local land trusts and the Forest Service to open glades on Barlett Mountain, home to the 1933 CCC-cut Maple Villa Ski Trail, and on South Baldface Mountain in Chatham, N.H. Ray says both glades are slated to open to skiers this winter, once the snowpack is sufficient. Doublehead Ski Trail, Jackson, N.H. This legendary ski trail starts at the new parking lot off Dundee Road in Jackson, approximately 1 mile east of Black Mountain Ski Area. Narrow in spots, the ski trail ranges from 15 to 25 feet wide. The lower half is appropriate for beginner and intermediate skiers, while the summit is better for more advanced powder lovers. Slippery Brook Glade, Chatham, N.H.
One of the larger and more challenging glades GBA has cleared sits off the east face of South Baldface Mountain. Volunteers thinned a dozen runs, suitable for intermediate and advanced skiers, this past fall, with a planned opening later this winter. Check GBA’s website for updates. Maple Villa Glade, Bartlett, N.H.
Just a few minutes north of North Conway, N.H., this glade uses Maple Villa Ski Trail as its uphill track. The downhill skiing follows a braided design, with uncut “islands” left for wildlife habitat. Park in the new trailhead area created this past fall on East Branch Road. Plow into another effort to revive forgotten trails and fly down Maine’s biggest mountain. Sign up for ski and snowboard workshops with AMC’s New Hampshire Chapter. Book a stay at Cardigan Lodge, AMC’s off-piste haven in New Hampshire. Ryan Smith is a former managing editor of AMC Outdoors.